My extremely lazy self loves a good cleansing cloth ... so when I came across Noxzema Clean Moisture Makeup Removal Cloths, I simply had to try them out. For starters, I really love the royal blue packaging -- it adds a bold, dynamic jolt to my skincare routine. The cloths themselves smell fresh and a bit medicinal, and they're loaded with Vitamin E to nourish and condition skin. The best part? They're even safe to remove mascara -- and they WORK! After sweeping them across my face, I'm left with a tingly, ultra-clean feeling -- not to mention a sense of accomplishment on nights when all I want to do is fall into bed without washing my face. 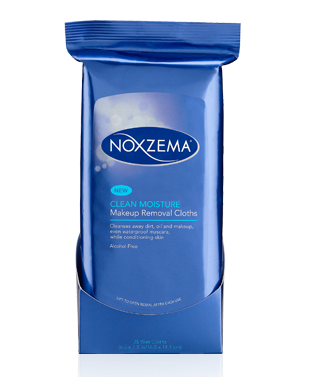 Noxzema Clean Moisture Makeup Removal Cloths are $4.79 for 25 at drugstore.com.